The Air Force is cracking down on underage drinking by requiring trainees to submit to random breath tests at dormitories throughout the country. Airmen under 21 will have to blow into a Breathalyzer, which estimates your blood alcohol level. The move is meant to curb related problems, such as drunken driving, sexual assault and domestic violence. In other news, the fiscal 2013 clothing allowance includes the new ripstop airman battle uniform, which is meant to be lighter and cooler than traditional ABUs. You can see a complete breakdown of the 2013 men and women’s clothing bag in this week’s Air Force Times. Also in this week’s edition: If you aren’t ready by the time the military personnel data system shuts down temporarily on Dec. 3, your pay could be affected. 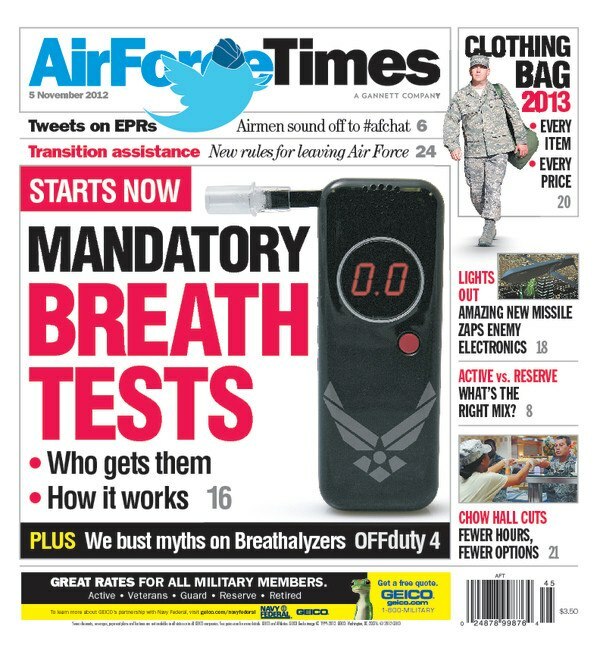 Air Force Times tells airmen what they need to know about the MilPADS shutdown. And on Oct. 25, Air Force got dozens of responses about what’s wrong with enlisted performance reports during a “Tweet chat.” Read what people had to say.